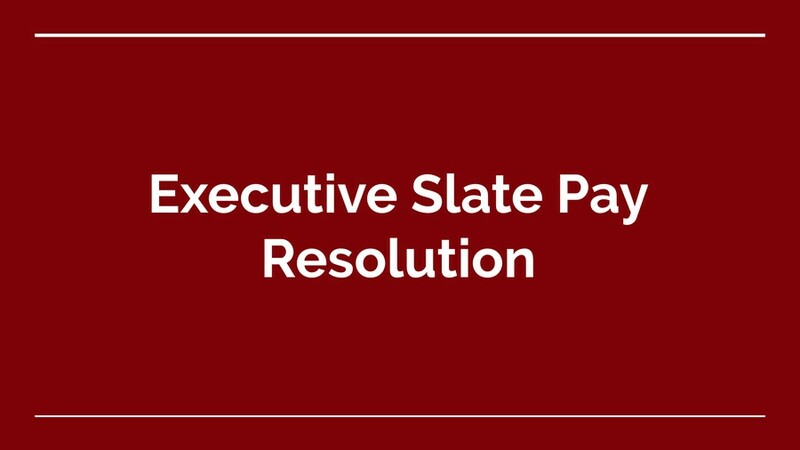 Student Government is considering a resolution for Executive Slate pay. Pictured: A slide from the Monday, May 14 meeting agenda. Student Government (SG) Assembly will consider a resolution on Monday to pay the SG president $4,500 per year and the vice presidents $2,250 per year. According to the agenda, "Funding would come from the SG Administrative Budget (currently at $21,000) and administered through the Committee on Registered Student Organizations (CORSO)." A resolution that would have instituted pay for SG leadership failed to pass two years ago. The resolution now under consideration, which you can read below, is sponsored by Graduate Council representative Jordan Johansen of the Division of the Humanities Division. Next year’s Executive Slate issued a statement opposing the payment plan after the vote. SG also passed a resolution on UCPD and mental health.